The Department of Transporation is cutting 1,200 jobs and closing 131 facilities throughout the state, including three district offices. It will also sell off 740 pieces of equipment. 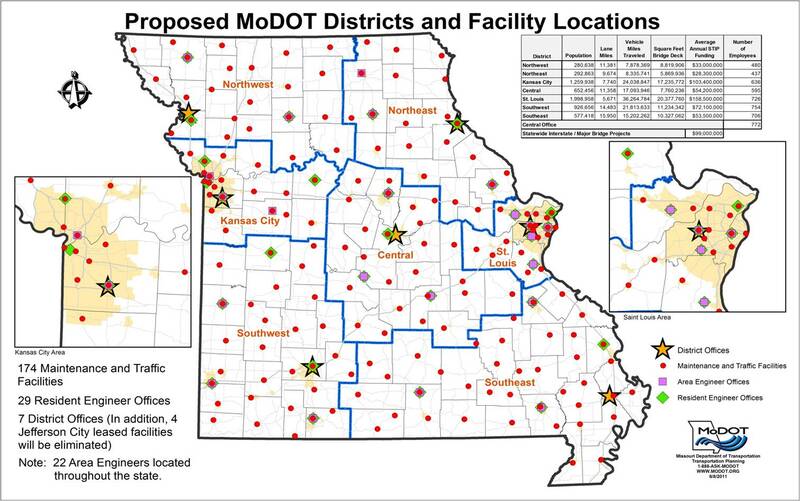 The Highways and Transportation Commission unanimously approved MoDOT Director Kevin Keith’s “Bolder Five-Year Plan,” which puts the cuts in place. Keith says most of the jobs lost will be attained through attrition, and he hopes he can keep lay-offs relatively low. He also stresses that MoDOT can’t function with a cut to the workers — what he calls boots on the ground — and that it’s middle management that will suffer the deepest cutbacks. The three district offices that will be closed are in Joplin, Macon and Willow Springs. Delegates from those regions have shown up at the last two Highway Commission meetings to voice their opposition to those closures. Keith says the new plan will be fully implemented by the end of 2012. The plan is expected to save $512 million by 2015 and $117 million each year after that, but Keith says that’s taking into consideration that the current amount of federal funding is still coming. He says if there are cuts to federal funding, the shortfall will be much worse than it already is. 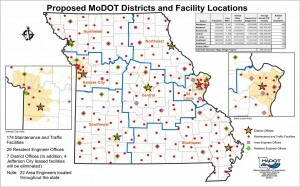 MoDOT’s annual billion-dollar budget has gone to about half.